A complete line of Sony NEX-VG20H accessories! You can find a full range of Sony NEX-VG20H accessories such as Sony NEX-VG20H batteries, Sony NEX-VG20H cases, Sony NEX-VG20H flashes, Sony NEX-VG20H chargers, Sony NEX-VG20H lenses, Sony NEX-VG20H filters and a complete line of lens adapter, shutter releases, underwater housings, and memory cards for your Sony NEX-VG20H camera. 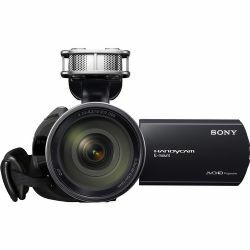 The Sony NEX-VG20 Interchangeable Lens HD Handycam Camcorder with 18-200mm Lens is the updated, second generation of the large-sensor Handycam camcorder, featuring an even higher-resolution CMOS chip and new 24p & 60p recording modes at 1920 x 1080 resolution. Like its predecessor, the NEX-VG10, the VG20 has an APS-sized sensor and an E-mount for attaching Sony's growing family of compatible lenses, and so the camcorder enables the shallow depth of field for which DSLR video cameras are so highly prized.